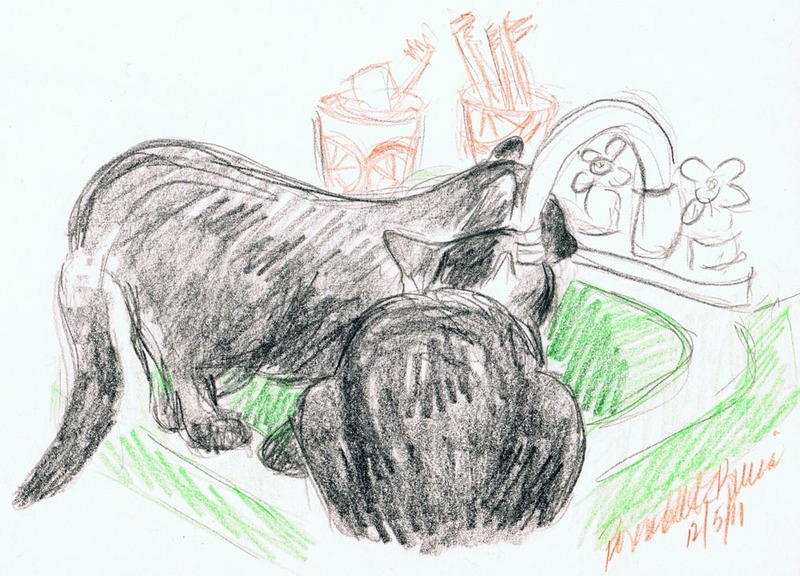 It’s a joy each time I hear from a reader who sees their cats in these sketches. Being compared to Warhol and van Gogh and Monet and Rembrandt is a compliment beyond compare. I have treasured each comment from both long-time and newly-exploring artists, those who’ve dropped the brush for decades and been inspired to pick it up again, young artists raised with electronic creativity and understanding the reason for putting a pencil to paper to create a single, unique, tangible object. I think I accomplished what I’d set out to do a year ago today, and I’m also very proud they won a Certificate of Excellence for a Set of Illustrations in the 2012 Cat Writers’ Association Communications Contest. Not quite daily, but about five days each week you see a sketch of my cats in action. On December 4, 2011 I stated my intention to present a sketch of my cats nearly every day and included the sketch above, “Three Cats”, signed and dated 12/3/11 of three of my kitties curled together on the bed. I could picture this one as soon as I saw them, and it was all I could to to sneak soundlessly away so I didn’t wake them to get my drawing pencil and pad. In cleaning out and renewing my old studio last year I’d found sketches and sketchbooks and studied and scanned and shared the images I’d found, quick daily sketches from years before with a different household of cats, bringing back memories of those days. Readers still enjoy those original sketches. 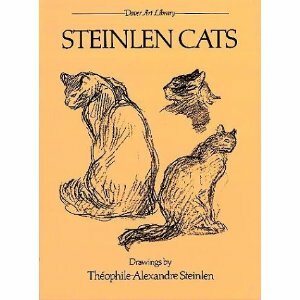 I was also inspired to keep sketching cats and to share them by my copy of Steinlein Cats, a Dover large-size paperback including just pages from Theophile-Alexandre Steinlen’s sketchbooks featuring his sketches of his own cats. A few of his poster designs from before the turn of the last century are iconic, as I mentioned in a post about a photo of mine that reminded me of one of his compositions. Remembering the days I had sketched something each day just as a matter of course, and how it was literally practice for my art as you’d practice music or long-distance running, I’d provided myself with convenient tools and took them up whenever possible to catch my cats in action along with my camera. Both of these activities were to “give me the incentive to do more and different work, to experiment, to be inventive and ‘in the moment’ with the subject and also with my ideas, something that’s rare in my daily tasks of commercial art,” as I stated then. And it was and is important to me to produce creative work each day, both for my personal and professional development and to share the ideal that not only magic can be found in everyday things and events, but it’s all around us, all the time. But a sketch each day? I’d debated the daily photo the year before but I’d no doubt I could produce a quality, interesting photo each day after looking back over weeks and months of photos…except, the time? I worked it into my daily schedule because the joy of sharing both my cats and my photos was immense. The sketches were different, created, then scanned and touched up if necessary because basic scanners are meant for documents and photographs, not drawing media—time-consuming, and I still wasn’t certain of my consistent ability. For the previous decade I’d spent so much time with non-art-related things while photography had filled the empty spot for my daily inspirations, I found I’d lost touch with some of my art materials and had lost confidence in my skills. Would I just embarass myself with awkward pencil drawings with no sense of perspective or proportion? Many people think art is entirely inborn talent, but talent doesn’t necessarily ensure skills with any media, and these things need to be regularly practiced as the afore-mentioned music or running. So I did. And to reignite my spark I returned to what set it off in the first place—my cats. And while I present my finished paintings all the time I decided it was important to present the underpinnings of that finished piece, the humble sketch, and let readers in on a little more of an artist’s creative life. 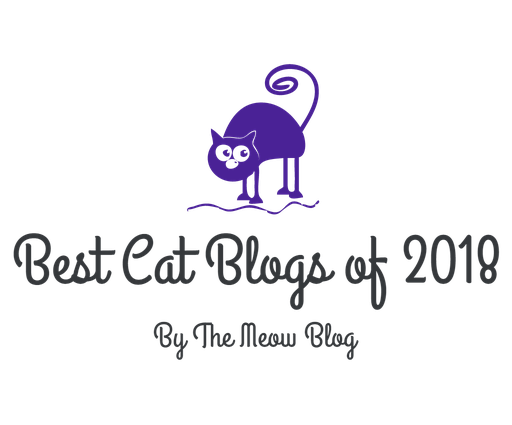 I also felt daily sketches of cats could provide a unique offering by The Creative Cat and add another element to the online conversation and image collections among pet bloggers. By December 3 I was satisfied that I could actually produce and present a simple sketch each day, nothing elaborate, spending about five minutes, 15 minutes maximum. I stated my intention on December 4, and on December 5 posted my first sketch created that day, “Boys at the Sink”. I was hooked. Since then I’ve documented the daily activities of my household in ink, charcoal, pencil, marker, gel pen, oil pastel, watercolor and more, discovered new media in watercolor pencils and rediscovered media in oil pastels, developed new styles, explored favorite and new artists for inspiration and brought my skills back to a level I can feel confident about. I am glad I had the chance to catch Cookie and Kelly in their last few months in these sketches that in many ways capture more of them than my large finished works—because I am right there with my subjects, these sketches are much more personal than the finished works. 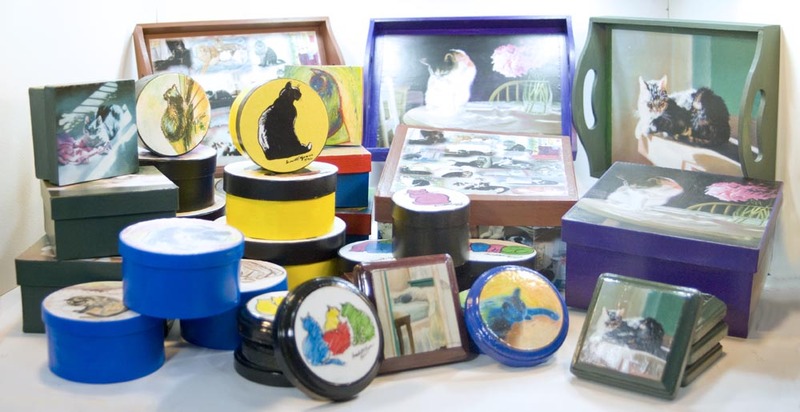 And the sketches themselves have inspired me to follow through with some long-time ideas of creating unique items with my artwork on them, like the keepsake boxes and trays and coasters, and the wood-mounted art. I can use the sketches as they are, build from them, or create others in similar style to create a set. They also give me smaller items to sell as originals. Not everyone has 24″ x 36″ of wall space for a finished framed pastel, and that’s not necessarily what everyone wants. These small sketches usually frame up to be 16″ x 20″ at the most, though many are 11″ x 14″. I’ve been happy to frame several originals to send home to customers. Below are a few examples; click on each to read more about the sketch. Click here to see other daily sketches, and if you are on Pinterest visit my daily sketches pinboard, the best way to see them all. I also offer these for sale as originals and prints. For a gallery of the ones available for sale, visit my Etsy shop in the “Cat Art and Prints” section. I can’t list every single one but that doesn’t mean one you’d like isn’t available. If there is a sketch you’d like to purchase as an original or print or other product, visit my page “Ordering Custom Artwork”. You can order a print as a set of notecards or greeting cards, framed or unframed, as a digital print or giclee and in various types of framing and mounting as well as applied to a keepsake product such as a keepsake box or wooden tray. As for Mimi, she thinks I spend entirely too much time on this because the more I make, the more she has to inspect. 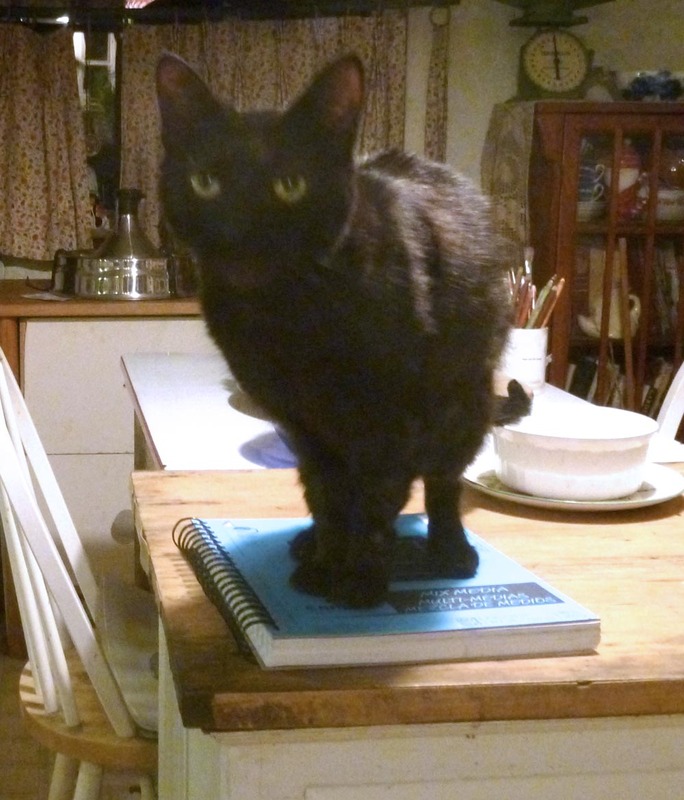 Here she stands defiantly (for Mimi) on one of my sketchbooks and demands dinner before any more of my personal fun. 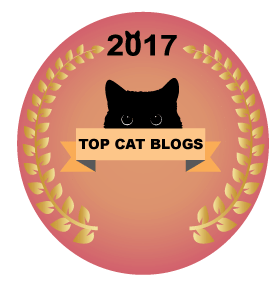 Pingback:The Creative Cat - Daily Sketch Reprise: What Are You Doing Up There? Pingback:The Creative Cat - Daily Sketch Reprise: You Want This Box? 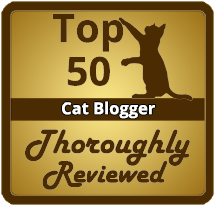 Pingback:The Creative Cat - Daily Sketch: What Goes On In That Garden of Yours? 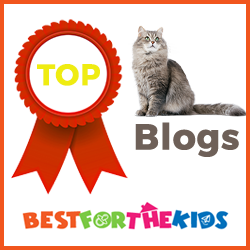 Pingback:The Creative Cat - Daily Sketch: What? Pingback:Sketch a Day – 12/5/2012 | The Dark Side of Digital Art. We love World Cat. And concatulations on one whole year of daily sketches!! Way cool!! 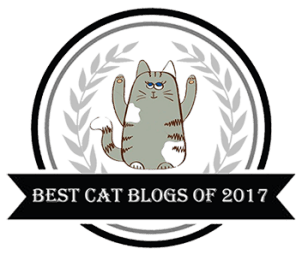 World Cat is one of my favorites too–I’m in danger of using it too often! 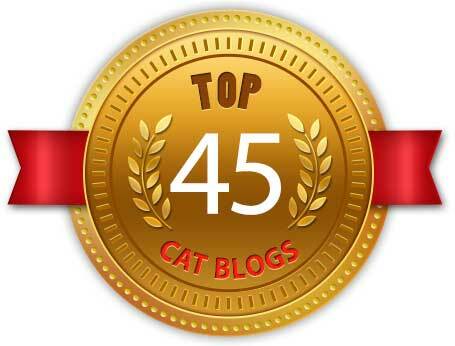 Thanks for the concatulations. I think they’ve all been hiding from me today so they don’t need to be sketched.